(Buy any 3 or more Vichy products and save 5%) Sorry, this item is currently unavailable. Click here to receive notification when this product comes back into stock. 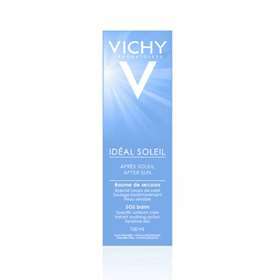 Vichy Ideal Soleil After Sun Repair Balm is specifically for sunburn care, containing the powerful active ingredient Epilobe Extract that soothes and instantly relieves the painful burning sensation. Plus a bio-absorbable Lipid Concentrate to target degraded cell membranes and restore their protective function. Instant relief from pain and burning sensations. Preserves the skin's cellular capital. Hypoallergenic,fragrance, colour and paraben free. Rub in or apply a thick layer of the rich texture over the areas requiring treatment. Repeat application for 4 to 5 days following sunburn. Skin will instantly feel relieved and intensively rehydrated, regaining its natural balance. In 24 hours, skin can feel soothed and redness calmed. Also available vichy after sun oil that can be used on wet or dry skin. If sunburn results in blistering, nausea or fever, consult your doctor. To avoid sunburn avoid sun exposure when the sun is at its strongest, around midday and for several hours. Keep children under 3 out of the sun and use an SPF suited to your skin type. Keep well covered, including hat, T-shirt and sunglasses. Aqua/Water, Glycerin, Alcohol, Denat, Propylene Glycol, Isononyl Isononanoate, Butyrospermum Parkii/Shea Butter, Hydrogenated Polyisobutene, Ammonium Polyacryloyldimethyl Taurate, Carbomer, Cetyl Alcohol, CI 77891/Titanium dioxide, Disodium EDTA, Epilobium Angustifolium/Epilobium Angustifolium Extract, Ethylhexylglycerin, Glyceryl Stearatem Glycine Soja/Soybean Oil, Myristyl Alcohol, PEG-100 Stearate, Stearic Acid, Stearyl Alcohol, Tocopherol, Triethanolamine, Parfum/Fragrance.